Last night I was at a loss for what to make for dinner, as I had no protein defrosted and could not bear the thought of packing up my exhausted after-school kid to head to the grocery store. As I scavenged the refrigerator, the garden, and the cupboard, I saw that I had pepperoni. My husband does not consider dinner a true meal if there is no meat involved, so I wondered what I could make with it that wouldn’t require me to whip up dough like a pizza. 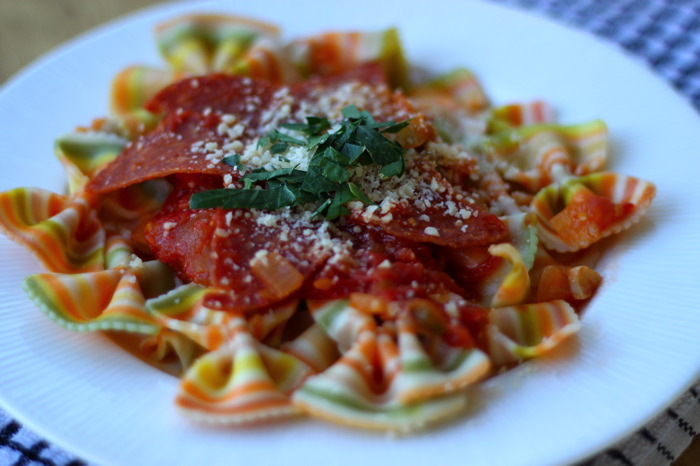 Pepperoni pasta? 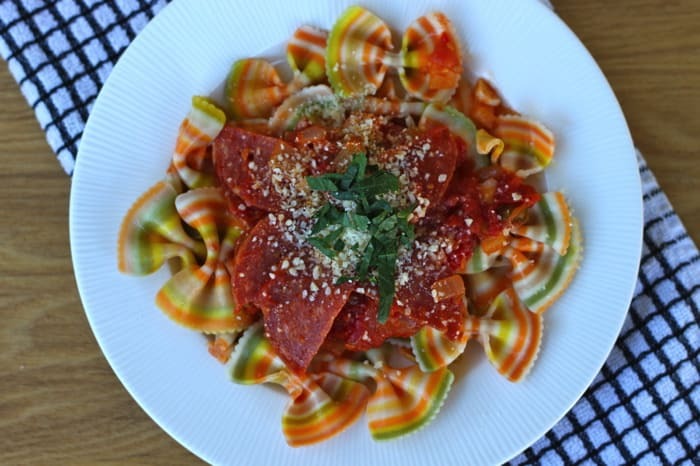 Pizza Pasta? Could it be done, like in a non-casserole, gourmet-ish kinda way? Would it be tasty? 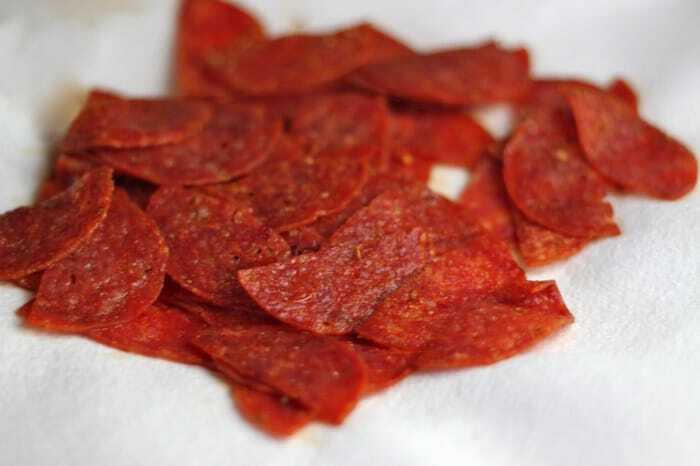 Take about 4 ounces of thinly sliced pepperoni and cut the pieces in half. Saute them in a hot pan until they are slightly cripsy and they render their fat, about 5 minutes. Remove them from the pan to a paper-towel lined plate. Pour most of the fat out of the pan. 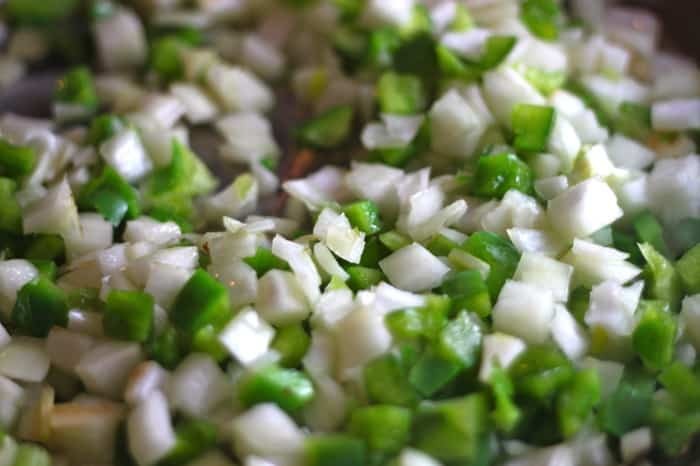 Dice one medium onion and a green pepper. Saute in the same pan in two tablespoons of olive oil until soft (about ten minutes). 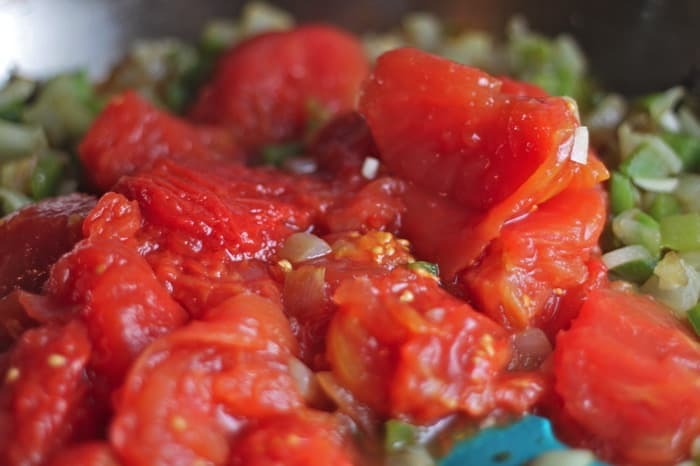 Add to the pan, then break up the tomatoes a bit with a spoon. Add the pepperoni back into the pan, and sprinkle some crushed fennel seeds (about a teaspoon or two) in there as well. Bring to a simmer (when you see the edges of the pan boiling), and put the lid on. Let the sauce cook down for about 25 minutes (or less depending on how much juice you have, keep an eye on it). 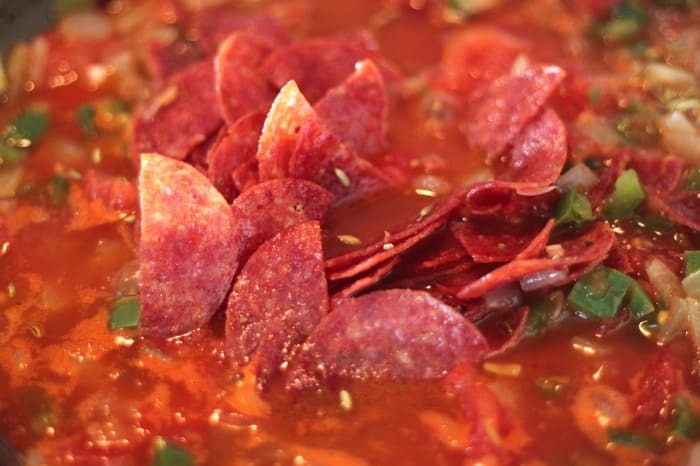 The pepperoni will get soft again and the sauce will thicken. In the meantime, boil your pasta (these rainbow bowties we picked up in Florence were a big hit with Scarlet). Serve the sauce over hot pasta with a sprinkling of parmesan cheese and parsley. You could also mix the fresh parsely (about two tablespoons diced) into the sauce, but this is prettier. Serve with a salad and some crusty bread. It’s pizza pasta! I hate when I don’t have any meat defrosted! I too think no meal is complete without some protein. My boyfriend also has a hard time counting a meatless meal as dinner. I’ll have to give this a try! 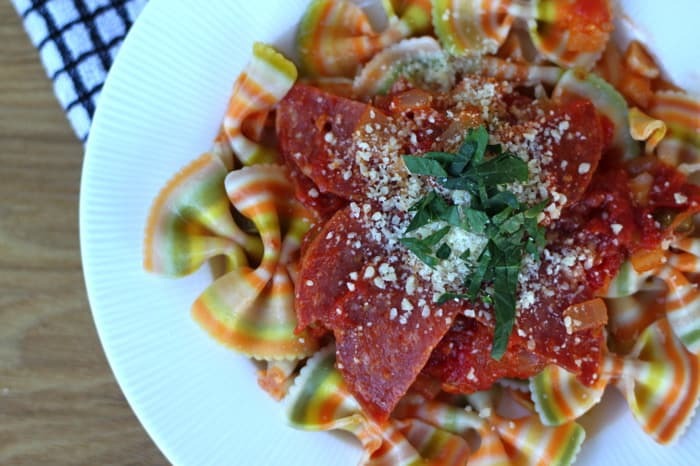 But is that pasta made from grain found in an Etruscan Tomb? i actually only eat foods found in etruscan tombs, duh. I love those noodles, how cute are they! And yes my kiddos love pepperoni marinara!! Awesome dish. This is a great fix for a weeknight dinner. Thanks for sharing such a great creation.